This post is part one of a three-part series on branding bots. Read part two on branding and persona here. We’re diving into how the elements of branding can manifest in conversational interfaces and how companies and products can craft their bot to communicate their brand well. Great bots have the ability to pull you in and connect emotionally with you, but bots need great branding to be successful. Building a great brand starts well before you design the bot’s interface (or any other interface to which you deliver your product). Great brands can transform an experience and evoke emotion in you. Brands can make you laugh, feel sad, or take action. They express human qualities that we associate with those companies. We can all think of examples of great brands and which traits we associate with them. Branding happens whether you plan it or not; it’s every single way that you communicate with your audience. A careful branding process backed by proper research and plenty of decision-making produces an outcome that is greater than the sum of its parts. Great branding considers the most effective ways to communicate and then carefully crafts visual and textual elements that will best deliver that communication. Brands include elements like a mission statement, marketing direction, language structure, colors, fonts, images, and an identity system (logo or series of logos). Like any other product, if a bot's branding is not clear and consistent, the experience will fall flat. Companies and products need to consider how their existing product brand extends to a conversational interface. Companies whose primary interface is a bot need to establish a strong conversation-focused brand. Designing your first bot is a great opportunity to embark on your first branding exercise or to reevaluate your current brand system. Whether you already have a well-established brand that you’re extending to a bot or you’re building it from the ground up, chatbots and voice assistants have particular devices for brand expression. 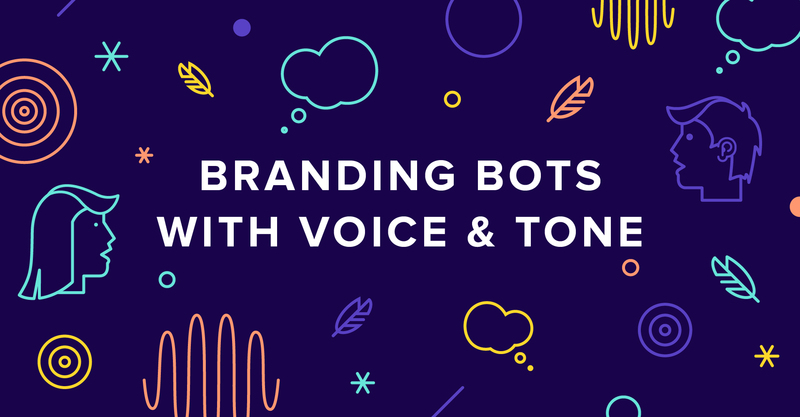 In this post, we’ll cover how your bot branding can use voice and tone to communicate with your audience. Voice and tone are an important part of any brand, but conversational interfaces like chatbots or voice assistants rely on it heavily. First and foremost they are textual interfaces that build a conversation with the user, and the voice of that conversation and the way that the tone adapts to the state of the conversation is important. The core values and mission of the company are the pillars of the brand’s voice. Voice should stay consistent and in alignment with the company’s values and mission. Bots are like an ambassador for the brand and they have to engage appropriately. The voice of a bot can be sarcastic, cheerful, or any other qualities you think reflect the core mission and values of your company. If you haven’t established a clear voice for your company, several resources can help guide you on your way. This explanation of Clearleft’s language refresh is a great example of (re)building voice and tone. Mailchimp has a fantastic content style guide (for their super-effective brand) that puts a lot of emphasis on voice and tone. Tone builds off of voice and it shifts with the state of the conversation and the emotional condition of the user. Tone helps conversations seem natural. After you've crafted a solid voice, then you need to consider when and how your tone modulates. Technology is pretty amazing, and advancements in Natural Language Understanding (NLU) allow us to extract sentiment from users’ language. Sentiment Analysis returns a positivity score on a string of text entered by a user. Additionally, tools like IBM Watson’s Tone Analyzer allow us to get a more nuanced view into the tone and style of language. If you’re starting small, and don’t want to integrate additional services like Tone Analyzer, there are plenty of options to help you make an intelligent guess about a user’s emotional state. Performing user research and analyzing the user experience will help you understand how the emotional states of your users shift as they interact with your bot. 🤔 Confused - when instructions are not clear, or users aren’t sure how to make a decision. 😖 Frustrated - when a user cannot complete a task, or they can’t find something in the interface. 😆 Delighted - when a user finds success in the interface or has accomplished a goal. 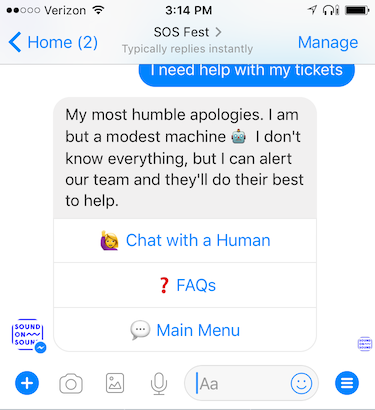 The Sound on Sound Music Festival bot incorporates the playful Renaissance voice of the festival while providing options to help that user get information that the bot doesn’t know yet. A natural conversation relies on a shared understanding, and bots and users build understanding throughout the conversation. When a user replies, “yes,” the bot needs to know specifically what the user is confirming. The shared understanding your bot builds with the user affects the language your bot uses. In a voice interface the answer “Home” from a user could mean that they want to visit a home menu, but if the bot is aware of the conversational context, it would know that the user is actually referring to a list of locations that the user is managing. As the user interacts with the bot, the state of that system, or the data that underlies it, also changes. Communicating these system changes to the user is important. Modulate the bot's tone so that the user’s emotional reaction is as positive as possible. Errors - Be clear about who is responsible for an error and how the user or the bot will resolve it. Make sure the tone is appropriate, especially if it’s your system that is causing the failure. Success - Noting the end state, especially success, is important for the user to acknowledge when they’ve reached the end of a task or accomplished a goal. Processing - Let the user know when a process is being carried out and how long it should take. We build our bots with flash messages and typing indicators to signal to the user when the bot has understood their request and that it’s currently in process. Delivery through a chat platform like Facebook Messenger versus a voice-based device like the Google Home also should have an effect on your language. Text-based conversations - Chat platforms have visual feedback and a temporal record of previous interactions. A bot can deliver other media like images and video that amplifies the meaning of a text response. Voice-based conversations - Since there are little to no visual elements that accompany interaction with devices like the Amazon Echo or Google Home, the communication context shifts for users. You must optimize your bot’s language for vocal delivery. 💡 Tip: Be sure you write the language of a Voice User Interface (VUI) like an Alexa Skill or Actions on Google for speaking. Read the interface scripts out loud as a role-playing exercise to assess and refine the bot’s responses. 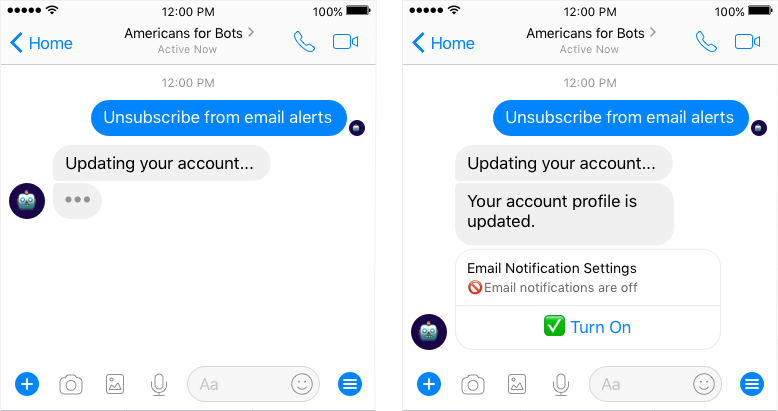 Facebook Messenger provides several features for you to craft bot messages that deliver content and meaning to the user. SSML or Speech Synthesis Markup Language gives you affordances within the language of your bot that help you modulate the way the voice interface speaks. You can adjust elements like speed, pitch, and pauses with SSML. Some voice interface platforms allow you to choose from a set of synthesized voices for your bot. You can also hire voice actors to record all the possible conversations your bot might have. Though this is a lengthy and expensive process, it allows for ultimate control over the bot’s vocal brand. Voice platforms come with companion mobile apps. Alexa’s mobile app supports the use of cards along with your Skill. These allow you to deliver images and text to the user when they interact with your Skill. You can use audio clips like tones, sounds, and music throughout your voice-based bot. These can provide brand elements like intro music or help ground the user with sound effects. Speechcons are predefined words and phrases spoken with particular emphasis that you can build into your Alexa Skill. Crafting an experience that effectively uses these elements will take some experimentation and iteration. Don’t pressure yourself to create an exact definition of how the brand uses all these elements until you have a feeling for how they’re all working together. This is process that takes a great deal of work, so start with understanding all these tools for branding conversational interfaces. This post provides a starting framework for developing voice and tone in your bot. There are several decisions that you will make as you outline how your bot delivers the core capabilities of your product to your users. If your product offering shifts, it is a good idea to make sure your voice and tone align to your product’s promise. You may also be considering building a persona that embodies your bot, which can be an effective way to express voice and tone in bots. Part 2 of Branding Bots will cover how you can use personas for your bot’s brand. We’d love to hear your thoughts on branding bots and how you’ve used voice and tone to communicate through them. Hit us up on Twitter @voxable. Stay up-to-date on all the bot knowledge Voxable drops. Sign up for our email list, and we’ll deliver our best insights about designing and building conversational interfaces right to your inbox.